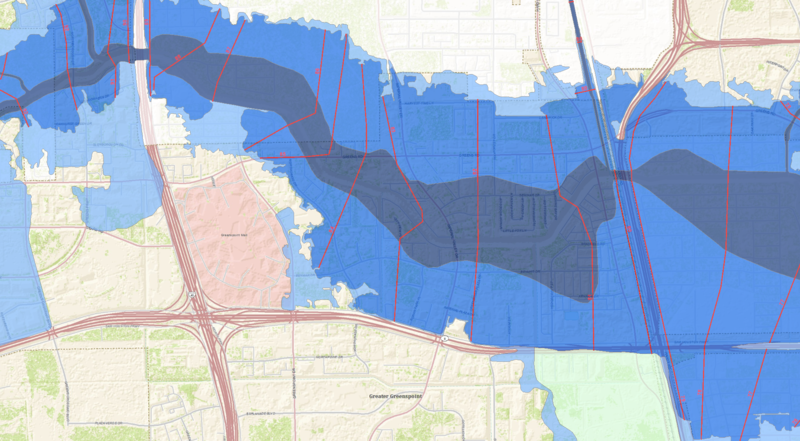 Below is a map showing where the apartments flooded in the Greenspoint area during the April 18, 2016 flood. Note that all of the apartments that flooded are in the 100-year floodplain for Green’s Bayou and some of the apartments are actually within the floodway – the no build zone set up along bayous and streams. While we understand that some of these apartments were built before the floodway ordinance, surely the 100-year floodplain was in place. Look closely and you’ll see that there are no detention ponds associated with most, if not all, of these apartments. Look around Houston. How many apartments are built in areas close to bayous? How many have installed detention? Did they pay a fee in lieu of detention? Was that fee used to build detention within the watershed where they were built or in some other unrelated watershed? Were any of the residents of these apartments aware that they were in the floodway or the 100-year floodplain for Green’s Bayou? Could the 1800 apartments here that flooded be called a man-made disaster? You bet your wet a$$ they can!! Yellow dots are the apartments that flooded in Greenpoint. Floodway, 100-year flood plain and 500-year flood plain.